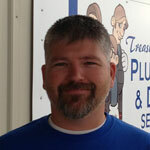 Eric Bullard is a Journeyman Plumber who joined our team of great Plumbers here at Treasure Valley Plumbing & Drain Service the first of October, 2012. Eric has worked all around the valley and has over 16 years of experience. Eric resides with his wife and 3 children in Parma, Idaho. He’s a great guy and seems to fit in very well with the rest of our crew here at TVPD. We are very happy to have Eric as part of our Team. Thanks Eric for joining with us to provide the Treasure Valley with the best quality and professional Plumbing service around.